Kenneth Bentley is a United States Marine squad leader through field promotion who is wounded in action and taken prisoner in 1969. He survives 4 years of captivity in an iron cage, tortured when he attempts escape. After learning of the U.S. surrender and having no other Americans around, he tries to adapt to a new life and identity when he is forced to assimilate into the Viet culture with a Vietnamese wife. Nestled in a secluded village in North Vietnam and struggling with dual identities, will Ken spend the rest of his life in that remote area, or will he emerge from that isolation to rejoin his family back home? Basic themes of survival and love intertwine with those of revenge and redemption to create a “true-to-life story that could belong to any one of the men left behind,” according to Ret. Navy Captain Eugene “Red” McDaniel, who was a POW for over 6 years in Hanoi. 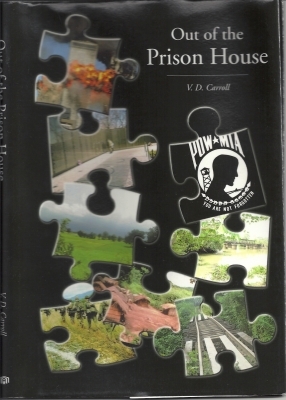 Find out what happens next in Ken’s unpredictable life in Out of the Prison House by V. D. Carroll. Whether you enjoy military fiction, action, intrigue, or romance, treat yourself to an exciting and action-packed book. Follow the gripping life of Kenneth Bentley in Out of the Prison House by V. D. Carroll. Order from Barnes & Noble, Amazon.com, or AuthorHouse.com. In March, 1973, 1,328 U.S. military personnel were listed as missing in action, and more than 1,100 others were considered to be dead, bodies not recovered. By 2010, the remains of more than 700 Americans killed in Southeast Asia have been returned and identified. Out of the 1,800 Americans still unaccounted for, the U.S. has identified 296 individuals, known as "Last Known Alive" cases. After fully investigating, the Defense Department has determined that more than 190 of these Americans are now deceased. The others remain unaccounted for. Yes, we left men behind in Vietnam, as well as in other wars. Out of the Prison House could be the story of any one of these men. V. D. Carroll has that rare ability to be both deep and entertaining at the same time. Carroll is a genuinely talented writer who has an original and gripping prose style, precise and powerful language, and a realistic story that can bring closure to the heart-wounds of those whose loved ones were left behind. The story provides a realistic perspective for those who’ve never been in the military, a challenge to reflect on what could have been had their lives been different. It provides a promise of hope and an answer to despair. V.D. Carroll is the pen name which Carroll Dorshorn used for this book. The author has also written a screenplay version, though it covers only part of the story. We'll keep you updated on the progress of that work, as well as the progress on the sequel to Out of the Prison House, titled When the Day Dawns.